The Film Agency managed the 360º event-cinema promotion of the One Direction film launch in Spain. 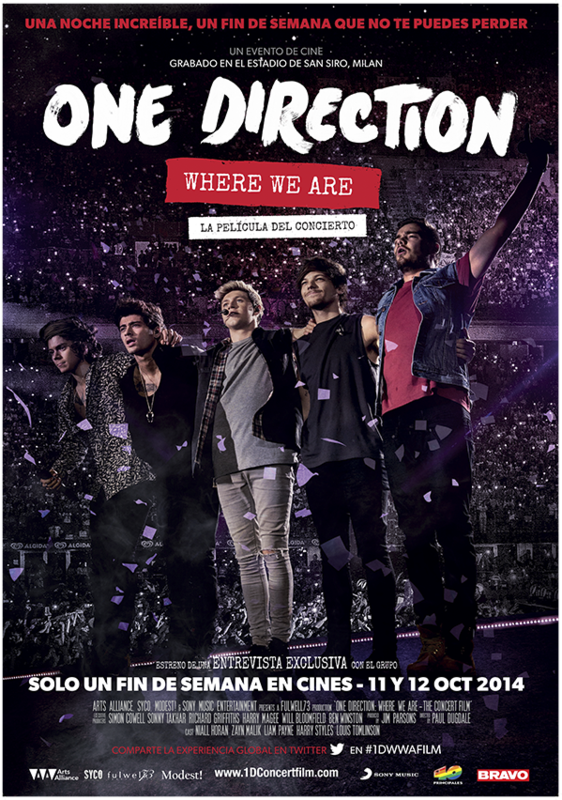 One of the top successful event-cinema releases of all times has been the concert film One Direction: Where we are. For one weekend, worldwide, Arts Alliance and Sony Music articulated an unprecedented cinematic wide release on October 11th and 12th 2014. The film is a 75-minutes concert film featuring additional 22 minutes exclusive to cinemas backstage interview with the band. We liaised with exhibitors, sponsors, fan clubs, communities, managers and media partners to give maximum visibility in cinemas. The core alternative marketing activity was an augmented-reality event where 200 girls were able to take a picture of themselves with virtual images of the 1D boys and also enjoy give-aways and merchandising. The event took place at Cinesa and the video was published on an exclusive basis through key mass media obtaining extra awareness to the launch weekend. One Direction - "Where We Are - La Película del Concierto"
Hundreds of fans were invited to come and enjoy a special day consisting in taking a virtual picture with the band thanks to an augmented reality app and watching the movie before anyone else. To attend the event, the fans needed to participate in the media partners contests (Los40 and Bravo, leading teenage mass media in Spain) as well as the One Direction Fan Club Spain key flash raffles.